One of the issues that concern many people who wish to adopt young-earth creationism as a valid view of earth history is the question of how stars can be seen many millions of light years away if only a few thousand years have passed since they were created. Dr. Russell Humphreys, a previous researcher at ICR, spent years working on this problem and has developed a creationist cosmology that seems to resolve this question. On the fourth day of creation, how long did it take God to make the stars and bring their light to earth? No time at all, according to clocks here on earth. That is what Humphreys concludes from his new creationist cosmology research. The cosmology presented in his 1994 book, Starlight and Time,1 had the light getting to earth in a finite amount of time, not instantaneously. The general features of that cosmology—a universe centered upon our galaxy, expansion of space, and gravitational time dilation—still appear to be correct. But Humphreys was never fully satisfied with its details because a) the solution did not provide enough time dilation for nearby stars and galaxies, and b) it was based on a metric—a solution of Einstein’s gravity equations—that was too complex to analyze fully. A referee for a subsequent relativity paper Humphreys wrote insisted that he derive a new metric to support the paper’s conclusions. After several months of mathematical work, Humphreys found the solution and the Journal of Creation published his results.2 The article’s appendix contains the new metric and derivation. In a series of Acts & Facts articles, we will describe qualitatively the implications of this new metric and how it explains the cosmology of the creation events. The new metric is not complicated, compared to many modern ones. Because it is simple and yet rigorous, it shows a feature of gravitational time dilation that nobody had noticed before. The feature was implicit in many previous metrics, but it had been obscured by the effects of motion. Humphreys calls this feature of time dilation achronicity, or “timelessness.” It causes clocks and all physical processes—hence, time itself—to be completely stopped in a region that could be very large. This is in contrast to the time dilation around a black hole, in which time is completely stopped only at a certain exact distance from its center, at the “event horizon.”3 In his 2008 article, Humphreys showed how this new metric led straightforwardly to achronicity. In the last five pages of the paper, he applied the time dilation achronicity to develop a new creationist cosmology. The first step in understanding this new cosmology is to recognize that space is not empty. Both science and Scripture strongly imply that space is a solid material that we cannot see or feel, though quantum field theory suggests it is extremely dense.1 We move freely through it and it moves freely through us.4 See Scriptures like Isaiah 40:22: “[God] stretches out the heavens like a [tent] curtain” (NASB), and 16 other similar verses.5 These verses invite us to compare the material of space to a stretchable fabric under tension,6 like that in a trampoline. The slope of the fabric is proportional to gravitational force. If we put a marble on the sloped part, it will roll inward toward the ring. Notice that if we put the marble inside the ring, it sits in a flat region and does not try to roll anywhere. This corresponds to the fact that in both Newton’s and Einstein’s gravity equations, the gravitational force is zero inside an empty hollow sphere. The depth of the dent at any given point is proportional to the gravitational energy14 at that point. Inside the ring, all points are at the same depth below where they would be if we had not put the ring on the trampoline. This corresponds to the fact that in both Newton’s and Einstein’s equations, particles inside a hollow sphere of mass have a lower15 gravitational energy than they would if the hollow sphere did not exist. Notice “the deep.” Its mass was on the order of twenty times that of all the galaxies within the viewing range of the Hubble space telescope.14 This was probably ordinary liquid H2O and would have been in the shape of a ball a few light years in diameter. If Newton’s gravitational constant G had the same value then as now (not necessarily true), all of the water would be well within the event horizon of a black hole. We are now ready to describe the most interesting events that permit light to get from the stars to earth in only a few thousand years. 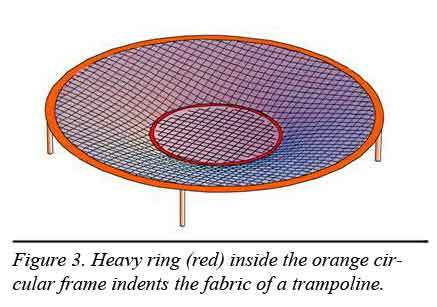 Humphreys suggests that an expansion occurred, adjusting the critical potential and conditions inside and outside the mass on our imaginary trampoline. Hence, a region of timelessness would have expanded outward from earth through space, allowing physical processes and events in the outer reaches of our cosmos to proceed while clocks on earth stood still. This cliffhanger of a story will be completed in future articles. They will address the events of the remaining days of creation and following. The timeless zone, gravity, and the speed of light interact to allow light to reach earth in a “short” period of time. Click here to read Part 2 of the series. Humphreys, D. R. 1994. Starlight and Time. Green Forest, AR: Master Books, 67. Humphreys, D. R. 2008. New time dilation helps creation cosmology. Journal of Creation. 22 (3): 84-92. Available on creation.com. Hawking, S. W. 1988. A Brief History of Time. Toronto: Bantam Books, 87. Achronicity would exist inside the event horizon if particles and clocks there could be motionless. But, it appears impossible for objects inside the event horizon to be motionless, which allows a way for clocks to continue ticking. Feynman, R. P., R. B. Leighton and M. Sands. 1965. The Feynman Lectures on Physics, vol III. Reading, MA: Addison-Wesley Publishing Company, 13. Feynman, along with many other authors, points out that, surprisingly, electrons can pass freely through a perfect crystal, “almost as if they were in a vacuum.” The reason for this lies deep in the heart of quantum mechanics theory, but the effect is a matter of observation. The same effect appears to apply to visible particles moving through the fabric of the heavens, which some Scriptures also compare to a crystal (Exodus 24:10; Ezekiel 1:22, 10:1). Ibid, 66. See 2 Samuel 22:10; Job 9:8, 26:7, 37:18; Psalm 18:9, 104:2, 144:5; Isaiah 42:5, 44:24, 45:12, 48:13, 51:13; Jeremiah 10:12, 51:15; Ezekiel 1:22; Zechariah 12:1. Many of these verses compare the heavens to a fabric. An intelligent creationist friend, wishing to avoid the implications of this verse, once told Humphreys it was “only a figure of speech,” trying to imply the verse is devoid of physical meaning. But note what kind of figure of speech it is—a simile, which explains a poorly-known but real thing by comparing it to a well-known thing. 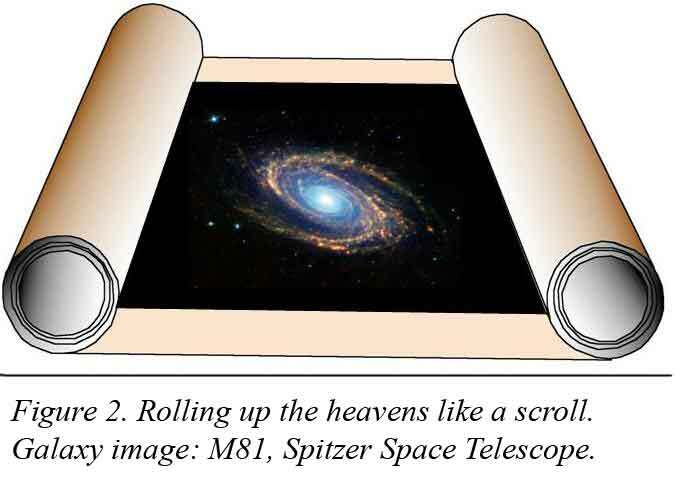 This means that the heavens will be rolled up physically, not figuratively, in a way similar to the rolling up of a scroll. Kaku, M. 1994. Hyperspace. New York: Oxford University Press. Because of the scriptural clues, hyperspace may be something real, not a mathematical convenience, consisting of only four spatial dimensions instead of 10 or 22. Humphreys, Starlight and Time, 93. According to relativity theory, time is yet another dimension, but it is different from the space dimensions. 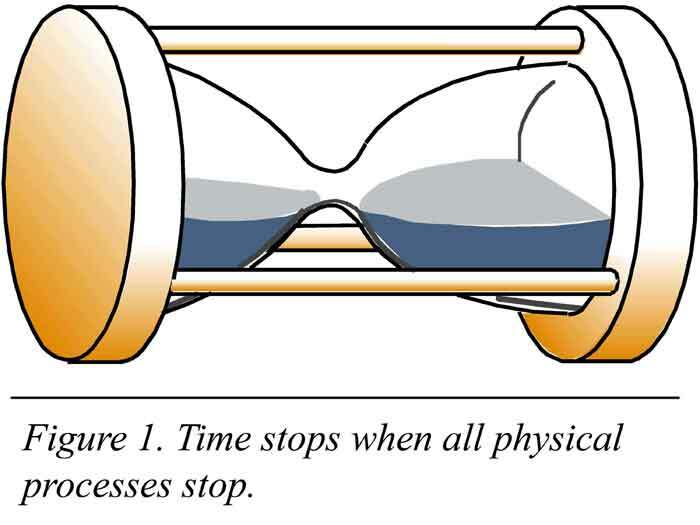 Technical note: Actually for relativity, spacetime. It is suggested that the fabric of spacetime is accelerating in this fourth spatial direction. It is probably not a linear acceleration in the fourth direction, but rather a centrifugal acceleration, with the fabric of space moving rapidly in the timeward direction and curving “upward” in the fourth spatial direction. 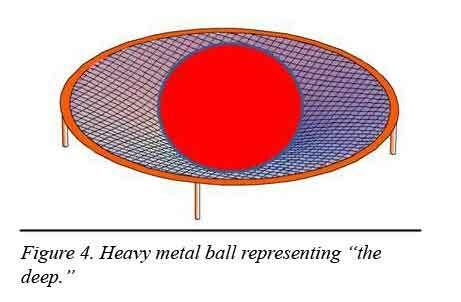 The inertial mass of the fabric itself would be balanced at every point by the force causing the acceleration. That means that without additional mass, the fabric would be flat in the three spatial directions. Only additional inertial mass at a point would make a dent in the fabric. With this simple picture, one can derive Einstein’s gravitational field equations. It explains several longstanding puzzles: 1) Why inertial and gravitational mass are equal; and 2) how the fabric of spacetime could be very dense (as quantum field theory demands) without producing gravitational curvature (as required by astronomical observations). Technical note: It works out that Newton’s gravitational constant is G = 4π g2/τ , where g is the acceleration in the fourth spatial direction and τ is the tension in the fabric. Both of those quantities would be very large. Technical note: More precisely, gravitational potential, the gravitational potential energy per unit mass. The potential would be g times the deflection in the fourth direction relative to the position the fabric would have with no mass added. The potential is a negative number, and its physical units are velocity squared. This correctly suggests that when gravitational potential becomes on the order of minus the speed of light squared, interesting things might happen. Technical note: Lower, because gravitational (potential) energy is negative. It gets more negative as the dent gets deeper. To put it another way, it takes positive energy to lift an object up out of the dent. It is not clear how the outmost region of space terminates. It could have a very large radius of curvature and close upon itself, for example, thus having no termination. Some of the “particles” could be the size of planets, in which case their interiors could contain liquid water even after the billions of years hypothesized by evolutionists. Whether large or small, the particles could be in orbits, of various planes and directions, centered upon the center of mass of the cosmos. * Dr. Vardiman is Senior Research Scientist, Astro/Geophysics, at the Institute for Creation Research, and Dr. Humphreys is Retired Associate Professor of Physics. Cite this article: Vardiman, L. and D. R. Humphreys. 2010. A New Creationist Cosmology: In No Time at All Part 1. Acts & Facts. 39 (11): 12-15.